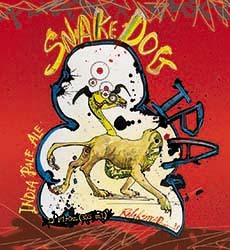 Snake Dog pours a light amber color with a large, creamy light-brown head. Aromas of heavy hops with herb notes. Also some honey. Initial flavor is both lightly sweet and bitter, finishing lightly bitter. Light and dry on the mouth with lively carbonation. This is a good IPA, but not our fav.